Local Series: The Original Suburb. I grew up in Myers Park, a much-loved neighborhood near Uptown Charlotte. Today, it is celebrated for its historic homes and beautiful tree-lined streets. Some families have lived there for generations. The neighborhood is seen as a present day icon, but many are unaware of its history. Myers Park was a streetcar suburb developed at the turn of the 20th century (c. 1905) by George Stephens on his father-in-law’s cotton farm and designed by the famous John Nolen, a Harvard trained urban planner. Nolen gained notoriety by designing neighborhoods and cities all over the country. Charlotte was originally condensed to four wards densely surrounding the heart of the city, Independence Square. Its population grew as a cotton trading town that expanded to the cotton mill and banking industries. Businessmen looked to farmland south of the city as a development opportunity they couldn’t pass up. But what made this all possible was the electric streetcar. Before the widespread use of the automobile, the streetcar allowed people to live out of the city but still be able to access the urban center, the location of the workplace and daily necessities. A short 1.5 mile ride, the easy commute and comparatively country living was irresistible for many Charlotte residents. Unlike other cities, the move to the suburbs in Charlotte was due to the incredible growth of the town. Before the Civil War it was a hamlet of several hundred people. By 1900 it was 18,000. For reference, the metro area now has a population of 1,745,524. The four original wards had gorgeous, large mansions of the rich. Of course Myers Park and other suburbs attracted the wealthy, but the large expansion of the city was really about its steady and enormous growth in population. Other suburbs part of this overall growth, such as Plaza Midwood to the west of the city, expanded at a slower rate because of its poor access to the streetcar. George Stephens made one very important move – he subsidized the streetcar in Myers Park so it would serve his community first and extensively. You might ask – how is Myers Park different from the growth patterns that we see in cities across America today? Isn’t suburban growth now the same? 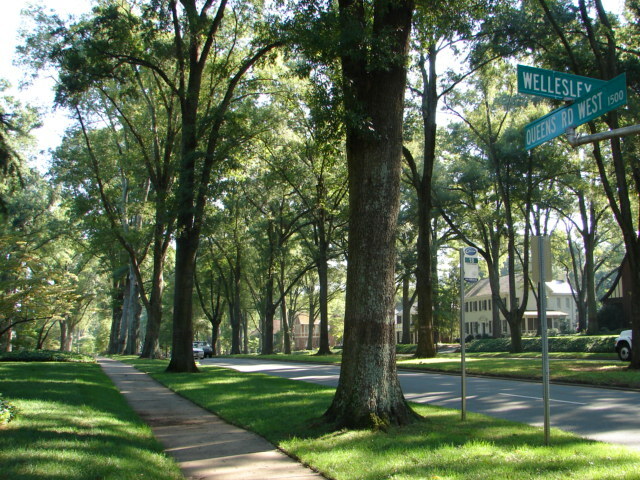 An example of the Garden Suburb movement, Myers Park was typical of early 20th century growth, and the majority of similar neighborhoods exhibit at least three characteristics that have sustained them as some of the most loved parts of cities across the country. As can be seen from the map below, Myers Park is a very connected and permeable neighborhood. Its perimeter block structure connects easily and clearly with its surrounding context. When Charlotte citizens travel from one side of the city to another they pass easily through the neighborhood. While this supports economic sustainability, which has led to successful commercial businesses, its real success lies in social inclusion. Because Myers Park operates as part of the larger city, it belongs to every one, not just the people who live there. This is its greatest quality. In consequence, the neighborhood has become well-loved and cherished. 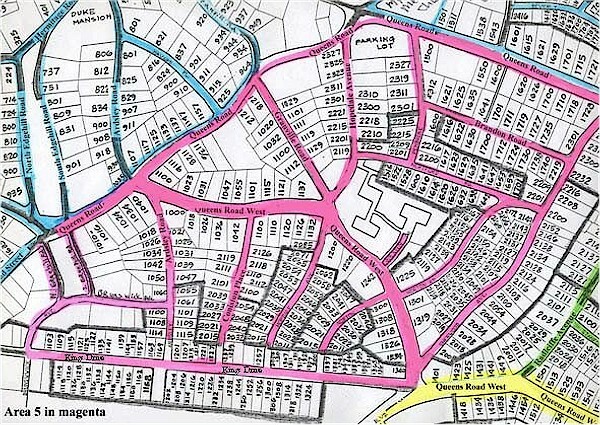 If Myers Park were built in the disconnected street structure of modern-day suburbs, it would exclude citizens in favor of exclusive residents. Not part of the larger city, it could have been forgotten over time. When a place is forgotten it isn’t socially or economically sustainable, suffering from dropping property values and closing businesses. While houses are spread out and set back from the road, three rows of trees are what give the street definition. The Myers Park streetscape is cherished and at any time of day you can see families taking walks, children riding their bikes, and adults going on runs. The side walks are buffered by a generous amount of green space and shaded by a canopy of beautiful oaks. Two lanes of traffic separated by large medians in the middle of predominant roads make room for the car while not overwhelming the pedestrian. Both live harmoniously. Visible and overlooked, the streets are safe and remain active in a car-centric culture. Many streets in modern-day suburbia have no sidewalks, or if they do they are small extensions of the road with no pedestrian buffer. Even if the streets were connected, which can be rare, the focus on the car can makes a pedestrian uncomfortable. There is an enormous amount of space in Myers Park that is donated to the public realm. While this land did not directly achieve a profit, there was no question on the part of George Stephens to its necessity in the development. Because of the inclusion of the streetcar, a larger amount of public space was necessary as part of the streetscape. But even so, the desire for open, country living allowed for a green infrastructure to infiltrate the city. Along with it comes ecosystems and a green lung that positively affects the people who spend time there. Today many developers are focused on a turn on profit. Public open space and investments in the public realm do not receive a direct profit. Recently, cheap housing prices and large amounts of space attracted buyers, despite little investment into making their neighborhood feel unique. Despite these very important and crucial urban design qualities, there is no doubt that Myers Park is still very much a suburb. Even with its modern-day central location, it does not feel urban. The reasons for this is that it is lacking two very distinctive urban qualities that would make it a completely sustainable development: density and mixed uses. Because of the trends of the time, these qualities were purposefully neglected. People wanted space from denser urban living and the streetcar allowed easy accessibility to the city center for daily necessities. Over time commercial uses have become established nearby. However, the large plots and low density make walking there a less attractive option than hopping in your car. But, it can be done. Some of the fondest memories from my childhood were walking from my house to the old Black Forest toy store with my grandmother. As I was researching Myers Park’s history, the drive for development built around public transportation reminded me of another part of Charlotte that saw a boom of development recently based on its location near the new Charlotte light rail system. In the same spirit as Myers Park’s development, mixed-use high density and multi-family housing, and restaurants sprung up along the South Boulevard corridor. While the light rail system isn’t expanding at a rate fast enough to satisfy urban designers, planners, and even citizens, it has shown to be a powerful and unparalleled catalyst for redevelopment and sustainable growth. Poetically, the reintroduction of the streetcar is happening at this very moment along a main corridor in Elizabeth. Time will tell its modern-day success, but I have faith that the streetcar will encourage the same sustainable growth that it did 100 years ago. In a time when the car is so prevalent, will the streetcar return glory to the city?